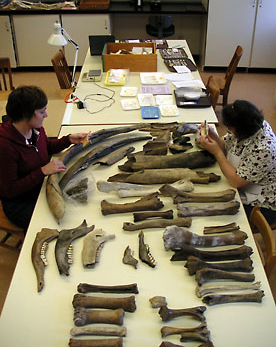 The Zooarchaeology Lab is located in 264 Condon Hall. The Department of Anthropology at the University of Oregon houses a comparative collection of over 500 vertebrate and invertebrate reference specimens used to analyze faunal remains found in archaeological sites located along the North Pacific coast. Professor Madonna L. Moss, Curator of Zooarchaeology with the Museum of Natural and Cultural History (MNCH), is working to integrate this collection with other biological collections on campus, including that developed by Patrick O’Grady (MNCH-Research Division), the Condon Collection managed by Edward Davis (MNCH-Collections Division) and the UO Comparative Primate Collection managed by Frances White. For more information, visit the Zooarchaeology Lab Homepage or contact Dr. Madonna Moss.